It's time for our favourite Bandicoot to return on probably the best high-end console out there in CRASH OF THE TITANS that once again reunites Crash with his arch-nemeses Neo and Nina Cortex who have unleashed their deadly plan to turn all the creatures on Crash island into genetic monstrous abominations. Without even thinking about danger, Crash valiantly speeds into battle as he attempts to restore harmony to Crash island before Neo and Nina Cortex threaten the very planet. With this classic arcade storyline, CRASH OF THE TITANS is a blend of action and humour in this 3D arcade game that involves puzzles, combat and a thoroughly entertaining time as players taken on a variety of strange beasts and their masters. Don't beat 'em – Jack 'em! Control, play and BATTLE as 15 different outrageous and totally unique enemies, including Scorporilla, Ratcicle and Shellephant – multiple playable weapons! Use their special abilities, breathe fire and strike with earth-shaking attacks. Use one enemy as a weapon to blow away the others…and then collect their skins to replay a level with their powers! For the first time ever in a Crash game Crash now has a powerful acrobatic fighting system: punches and flying kicks, multiple attacks and special counter moves. Power up skills to unlock new attacks and blazing combos! Sure, he still spins, but now he's got some serious moves to back it up! With an amazingly expanded moveset, Crash can now interact with his world in totally new ways. Climb trees, swing from ropes, flip off springboards – but that's just part of the package. Crash can even toss Aku Aku on the ground and surf, skate, grind and shred. Ready for some Crash on Crash action? That's right – it's twice the Crash! At any point in the game get your buddy to join in and play as Carbon-Crash, and work together to unleash total chaos! Crash can even jack Carbon-Crash (or vice versa) for some hysterical Crash/jacked-Crash mayhem!!! Unlike traditional Crash games, the developers of this current incarnation have added a variety of new features and gameplay options into the title making this the most innovative title to date. Crash now has the ability to interactive more with the gaming environment due to his new acrobatic skills, allowing him to climb ropes and even perform some great snowboarding and skating moves as he races through Crash island. The player must also assist Crash in a variety of mini-missions that are all linked with the main storyline. 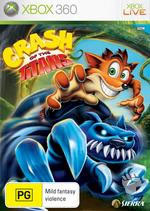 The difficulty level of CRASH OF THE TITANS ranks between easy to moderate, depending on the gamers experience level and most novice players will have no difficulty in mastering this title. This is helped by the almost perfect control system on the controller that is perfectly mapped. Although most of the buttons are used, players will have no problem navigating the gaming environment and challenging the various foes in the game. The game also uses various checkpoints throughout the levels, ensuring that the player does not become too frustrated. Combat is extremely entertaining in this current incarnation of Crash as the main character can perform a plethora of new fighting moves which are all easy to master. The new fighting maneuvers of the title make this game a "light" fighter that allows for flying kicks and even counter moves which come in handy with some of the opponents you face. The AI of the title ranges from easy to difficult with some of the boss characters being quite frustratingly difficult to defeat but each of these bosses have a "trick" in defeating then. Graphically, CRASH OF THE TITANS is a visual candy treat on the XBox 360 that features a real Saturday morning cartoon feel to it with its "cartoony" graphics that suits the genre perfectly. The gaming environments are extremely detailed and quite colourful that are matched with a variety of special effects such as fire effects and gorgeous lighting effects. The main characters are also well animated with great use of textures, colours that almost make the characters come to life. The soundtrack of CRASH OF THE TITANS goes hand-in-hand with the graphics with its modern yet cute musical score that will make even the most staunchest of gamers bop along to the theme. Add in a variety of strange and bizarre sound effects of the universe of Crash and you have everything you need to compliment your audio experience. In conclusion, CRASH OF THE TITANS is a very impressive arcade game on the XBox 360 with its detailed yet "cartoony" graphics, addictive gameplay and amusing storyline that will suit gamers of all ages. Definitely recommended to those players who are in need of a good arcade fix and CRASH OF THE TITANS is definitely that game. Go Crash!